We fish in November because after months of relentlessly pursuing something, it would be uncomfortable to quit it cold turkey. The whole “not fishing” thing is something that needs to be eased into. November then, serves a few different purposes—the primary one being the longing for “one last fish” at the tail of the migration before the winter storms roll in and the water becomes totally devoid of life. 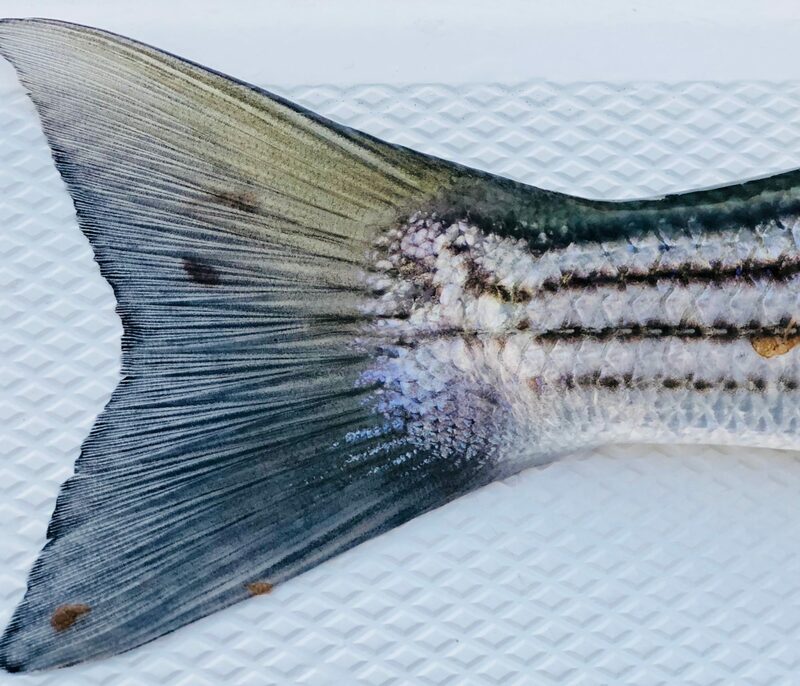 Striped bass in November, however, are noticeably fewer and their patterns are tougher to predict. The late Fall migration on the Cape isn’t a shadow of what it is in Montauk and the other Southern points in the migration path. By November, the entirety of the migrating biomass has mostly reversed its parade route and moved south to warmer, more bait-filled waters. The run happens quickly for us around the Cape. Blink—or oversleep—and you might miss it. But the eleventh month still holds the promise of a fish or two before everything is stowed away for the return trip. There are stories, legends of massive stripers straggling behind, lurking in the waves and in boulder fields well into Thanksgiving. I tie a spook plug to my leader and cast from the surf. Darkness comes easily, daylight quickly shrinking away into night. High tide turns the beach into a featureless, endless shoreline. There’s no moon, only the stars spread out against the sky and the horizon and dark water; a single presence, a painting all in black. I begin to lose track of where I am, what I’m doing, how long I’d been there. The sea crashes and recedes against the deep slant of beach, grating the pebbles and rocks into sand. I continue casting, rhythmically, trance-like, each motion punctuated only by the far-off splash of the plug tumbling to the water in between the perpetual sound of rollers. Casting is like breathing, in that I don’t have to think about it, but if I stopped, I’d be dead. My mind drifts back to fishing, and there are strands of hope. A school might come through, a striper that hasn’t migrated yet might hit my plug, I might actually get a hit tonight. But it’s not the only reason I’m standing in the freezing cold blackness of November. I’m fishing because I believe as human beings, we have a primal need to not only bear witness to nature, but to engage in it, to become a part of it. And the time in which we’re granted this opportunity is finite. I’m fishing because I knew I’d be the only one on the beach, sloping infinitely into the Atlantic and there’s a certain nirvana that I’m convinced can only occur in this exact situation. I’m fishing because if I wasn’t, I’d be home swearing to myself about how I should have been. And when the first snow falls in a few weeks, I’d be doing the same thing. I’m fishing because, although I’ve been fishing all season, I never get tired of it. I’m fishing because November makes a perfect epilogue to the story arc that is the pursuit of striped bass on the Cape. And yes, I’m fishing because I’m convinced there’s a fifty pound bass swimming somewhere in the flood tide in front of me.